It's one of my favourite times of the year. Summer is officially over, yet the sun still bubbles like Champagne. There is a genial coolness in the air and when the breeze grazes my skin, I feel a tender shiver upon my body. Toronto is set for Fall. And although the leaves are still green, soon, they will turn golden and scarlet - much like the colours of a Mediterranean sunset. It's on a perfect day like this that I love to sit down and just delight in the moment. With a loaf of Italian bread, a ramekin of Provençal Picholine olives, and a fine bottle of Umbrian D.O.P. extra virgin olive oil (sorry folks, no wine for me), I have the ultimate picnic with myself. As I cajoled the olio out of the bottle, the emerald-gold that trickled out anointed the bread with a fruity, slightly earthy flavour. Then I pop a Picholine into my mouth, sucking its briny meat until only the seed is left. There was nothing else to do but spit the pit out, then perform the ritual all over again! This is how life ought to be. Transferrable (can be enjoyed not only in the countryside of Italy, France, or Spain, but virtually anywhere). Simple. Without remorse. 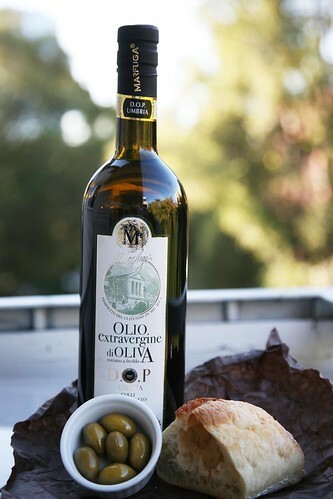 Note: Olive Oil: Marfuga, from the Spoleto Valley in Umbria, Italy. Well worth the $60 CAD splurge.